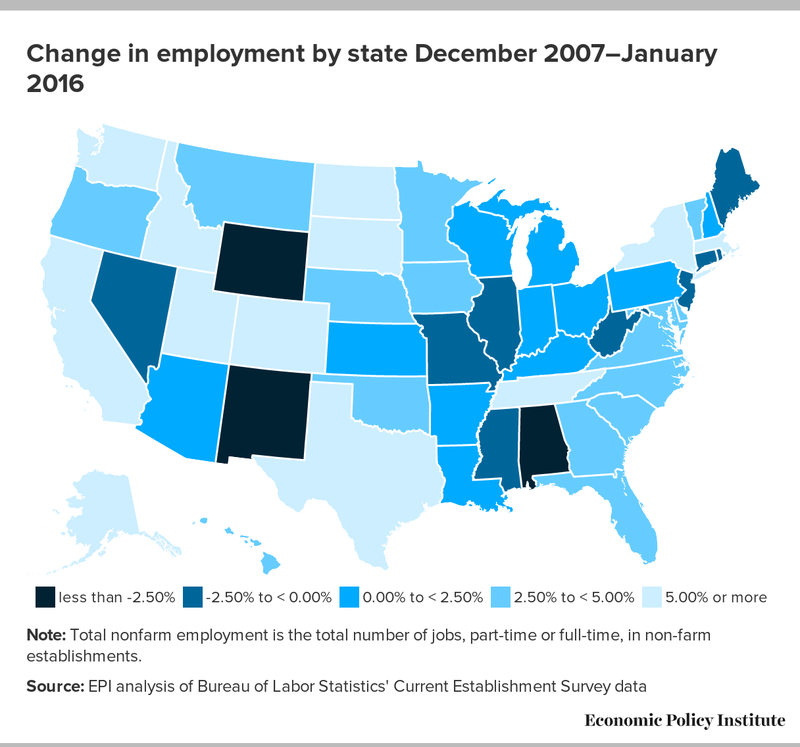 Today, the Bureau of Labor Statistics released January state employment and unemployment data that largely reaffirm the trend of general economic improvement in most states, while a handful of states continue are faltering a bit due to the decline in energy prices. 41 states and the District of Columbia saw gains in employment from January 2015 to January 2016, while 9 states experienced job losses. Tennessee (+3.7 percent), Oregon (+3.5 percent), and Colorado and Florida (both +3.4 percent) saw the largest percent gains among states with employment gains from January 2015 to January 2016. Over the same time period, North Dakota, Wyoming, and Alaska experienced the largest declines of -5.4 percent, -3.3 percent, and -0.8 percent, respectively. 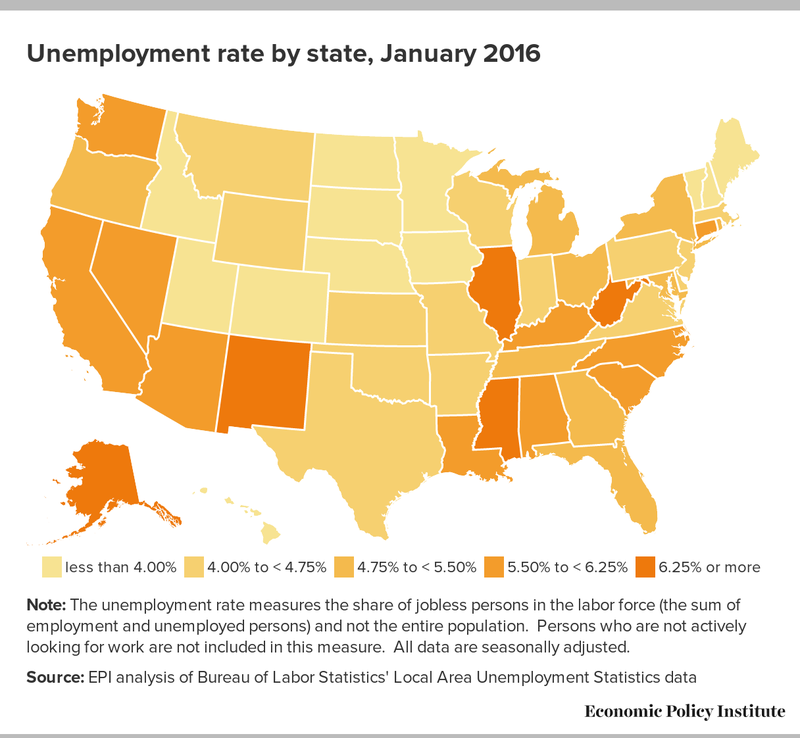 Changes in unemployment rates across the states largely corresponded with employment trends. 38 states had declines in their unemployment rates, four states had no change, and nine states experienced increases in their unemployment rates. New Jersey (-1.9 percentage points), Arkansas (-1.2 percentage points), and Rhode Island (-1.2 percentage points) experienced the largest declines. The largest increases in unemployment rates occurred in Wyoming (+0.9 percentage points), Kentucky (+0.5 percentage points), and Illinois (+0.3 percentage points). As has been the case over the past 15 months, states heavily dependent on the energy sector stood out from the rest: the pressures of lower energy prices continue to affect both the energy sector and other industries supportive of, and benefiting from, the energy boom in those states. Some national trends still indicate shortcomings across all states. The U.S. manufacturing industry continued to experience anemic growth nationwide, with only one state having recovered to its pre-recession manufacturing employment level (Alaska). The manufacturing sector may continue to be undone by persistent trade deficits, which are often caused by currency manipulation on the part of trading partners, such as those countries that make up the members of the proposed Trans-Pacific Partnership (TPP) agreement. In 2015 alone, trade with TPP countries cost the U.S. 2 million jobs. Though most states have seen solid economic growth over the past year, we are still not where we need to be and we still need policies that ensure economic growth reaches the majority. As a recent report by EPI’s Elise Gould shows, 2015 continued the pattern of rising wage inequality—most of the bottom half of wage earners were paid less in 2015 than they were paid in 2000, after adjusting for inflation. The bit of good news from 2015 was that those workers at the very bottom of the wage scale—those at the 10th percentile—experienced wage growth of 3.3 percent last year. Perhaps unsurprisingly, the largest wage gains occurred in states that increased their minimum wages in 2015. The minimum wage is a good way to begin boosting wages for those at the bottom, but we’ll need more to generate broad wage growth across the board (as we did see nominal wage growth decelerate in February). As state and federal budget season moves gets underway, lawmakers should consider fiscal stimulus options to further boost growth, and Federal Reserve policymakers should hold off on raising interest rates again until we reach a tighter labor market that registers real wage growth for most U.S. workers.